Is is possible to repair a SE/30 with reversed C2 and C11 capacitors? Shamelessly stolen from BobDenford on Reddit. I recapped my SE/30 but mistakenly reversed the polarity of the two axial capacitors (C2 and C11). Prior to my error, the machine was fully functional with the exception of being unable to produce sound. When I turned the computer on the first time after replacing the capacitors, the startup chime rang. The computer was on its side, so I didn't see whether the display worked. I turned the computer off, attached the floppy and hard drive, put it right side up, and powered it back on. The fans spun up but the computer otherwise did nothing, even after I reset it a few times and let it sit powered on for a couple of minutes, at which point I removed the motherboard, discovered my error, and replaced the two capacitors, the larger of which (C2) was bulging. After doing so, the computer still refused to produce any video or sound. I tried reseating all of the onboard components, removing all but two sticks of RAM, resetting the PRAM, and pressing both the debug and reset buttons on the side of the motherboard several times to no avail. The floppy drive does nothing, even when a disk is inserted, and my scsi2sd flashes a yellow light once upon powering the machine on, then remains inactive. There is no obvious physical damage to the board, aside from the now-replaced bulging capacitor, and there is no indication that any of the components are missing their magic smoke (that is to say, I never saw, smelled, or heard any). A working motherboard inserted into the same machine produces a display (no sound, still have to recap that one). Is the board irreversibly destroyed? If not, what is likely to be damaged and how can I repair it? This is what I can see on the main circuit board. A quick glance tells that C2 is connected between ground and +12 V through a ferrite (L11) and 5 Ohms (two 10 Ohm resistors in parallel, R14 and R15). That means that you tried to take up to 2.4 Amps from the 12V. I doubt it was designed to handle that much current. The question is if the resistors were burnt also. C11 is connected directly between +5V and ground. The schematics I got hold of might not be correct ones for the power supply. They contain 2x +12 V. Disk and Sweep. I will here follow the +12V Disk, since it seems the most probable. Since the power supply is completely without protection in form of fuses or over current for the +12V, the transformer (TI51) might been burnt. If the +12V (Disk) is missing, the transformer is most probably bad. The +12V Sweep is generated in IC252, which seems like a normal voltage generator, so in the case of +12V Sweep being bad, I'd say that the problem is in IC252. Not the answer you're looking for? Browse other questions tagged apple-macintosh repair or ask your own question. I've taken my Amiga computer out of storage after several years and it doesn't work. What's the likely cause? How do I troubleshoot an Apple //e with no power light? Is it possible to bend tension back into atari 2600 joystick contact domes? 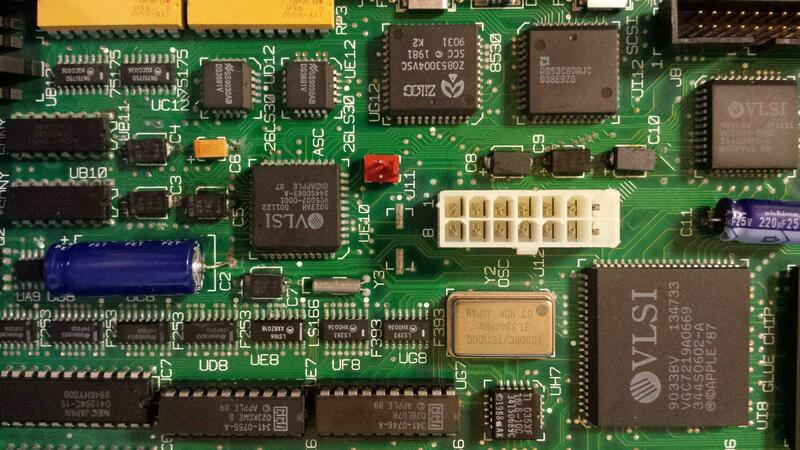 What's a safe and easy way to desolder the CPU from C64? What are best techniques for repairing a chemically damaged PCB? What happened to the Apple Device SBC that was supposed to compete with the linux SBCs?